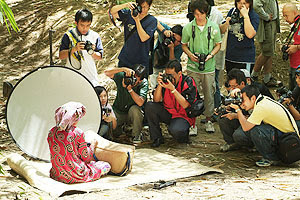 Thirty-five photographers attended a three-hour session on "Portraiture with Nadi" which was organised by Gemilang Foto of Gemilang Association, Tutong recently. Nadi, a professional and an International award winning photographer, shared his experiences and gave tips on how to get best portraiture. Participants were able to see his collection of photos portfolio. The session ended with a practical lesson.